Welcome to the Staggering Stories Audio Musings. I’m Adam Purcell, and I’ll be your host for this musing. This is my third and final, at least for this set, musing about Herd Nurdles – things I like that I often think I’m completely alone on. 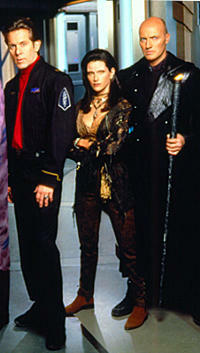 Poor old Crusade, the Babylon 5 spin-off. I’m a big fan of Babylon 5. I’m never sure if Babylon 5 or Doctor Who is my favourite TV series – there’s nothing between them. I’m not going to pretend that Crusade is up there with B5 or Doctor Who but I really enjoyed it nonetheless, what there was of it, that is. It didn’t last long, TNT (the cable TV station behind it) meddled terribly to the point of killing it. Probably worse even than Firefly got from Fox. Basically for the first couple of seasons or so, it was to be about our heroic heroes venturing forth into the unknown to search for a cure to a nasty plague that was about to wipe out everyone on Earth. Going in, we kind of of knew Earth would be safe – we’d seen the final B5 episode, Sleeping in Light, set some 10-15 after Crusade season one and Earth was fine then. That’s not the point, though. The B5 universe is littered with history. Wars between the First Ones raging over billions of years, younger races rising all falling throughout that time. It’s all about the crew of the Excalibur searching the dead worlds left behind by these conflicts and getting into bother. No, it’s not even about that. “Who do you server and who do you trust.” There’s Galen, an apparently kindly Technomage who is manipulating Captain Gideon and his crew, for reasons we, sadly, never really discover. You also have the wonderful ‘Apocalypse Box’ an ancient alien- something that Gideon ‘won’ in a card match. It speaks to him, demands he keeps its existence secret. It too is manipulating Gideon and it hates Galen (but Galen doesn’t know about it). Clearly there was a showdown due to happen between Galen and the Apocalypse Box – who would Gideon serve or trust. We never got to see it. Like first season B5, there’s more going on here than meets the eye. It’s fun to watch and speculate what is going on. There’s some great characters – Gary Cole’s Gideon, David Allen Brooks’s amoral archaeologist Eilerson and I actually thought Peter Woodward’s Galen was great. I did, really! Cut down before its prime – it’s worth a reevaluation. I believe it is still available on DVD, probably for a very reasonable price if you look around. This entry was posted on Saturday, August 1st, 2009 at 17:28 and is filed under commentary, podcast, Sci-Fi, Staggering Stories Musings Podcast, tv. You can follow any responses to this entry through the RSS 2.0 feed. You can leave a response, or trackback from your own site.